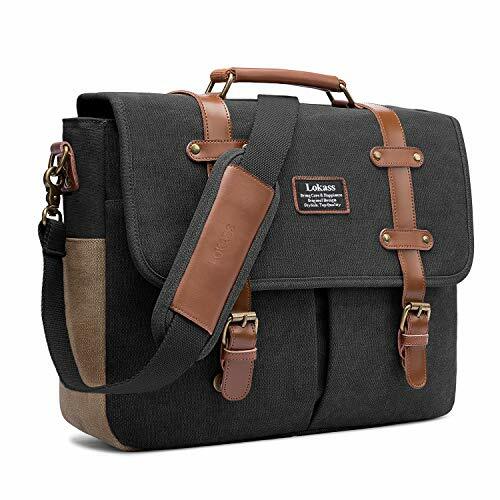 EASILY CONVERTIBLE -- Skillfully designed to be a laptop messenger bag / shoulder bag with single shoulder straps,or according to your needs,converted easily to a backpack with backpack straps which can be hidden in back compartment. WIDE-OPEN & PROTECTIVE -- With Wide-open Design of main compartment,you can open it very widely,providing a quick access. 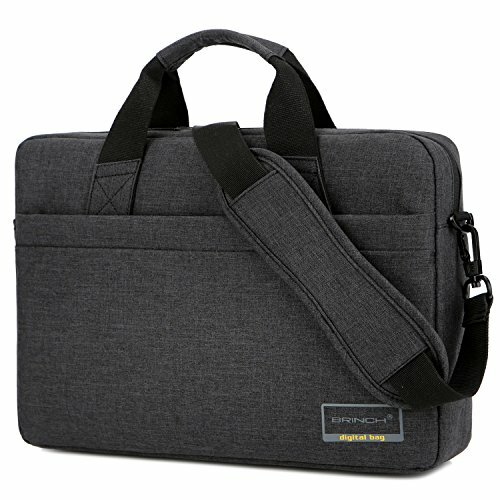 Built-in well padded laptop sleeves with velcro elastic fixed strap provides extra protection for your laptop from bumps,impacts,and scratches. PROFESSIONAL POCKETS -- In accessory compartment,Phone Pocket,Wallet Pocket,Card Pocket and Pen Pockets are specially designed here. 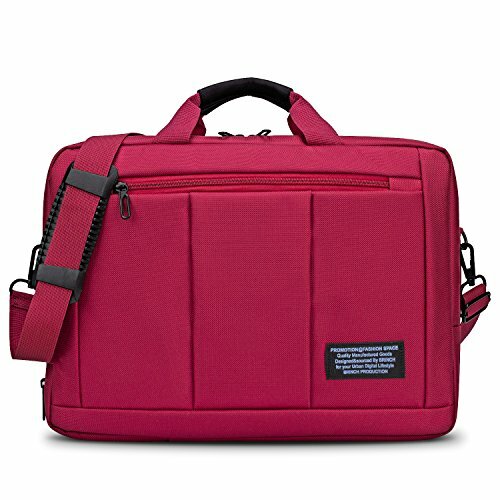 DURABLE & PORTABLE -- Made of high quality water-resistant nylon materials & anti-tear lining with excellent sewing.You can carry it in more comfort: (1) On hand by handles. (2) On shoulder by single shoulder strap. (3) On shoulders by backpack straps. SIZES -- Exterior:43x32x12CM/16.9x12.6x4.7Inch; Laptop compartment:40x30CM/15.7x11.8Inch; Fits most up to 15.6 inch Laptops ( Apple Macbook / Acer / Asus / Dell / Fujitsu / Lenovo / HP / Samsung / Sony / Toshiba etc. ),may not snugly fit all computers due to variations in the sizes of different models. 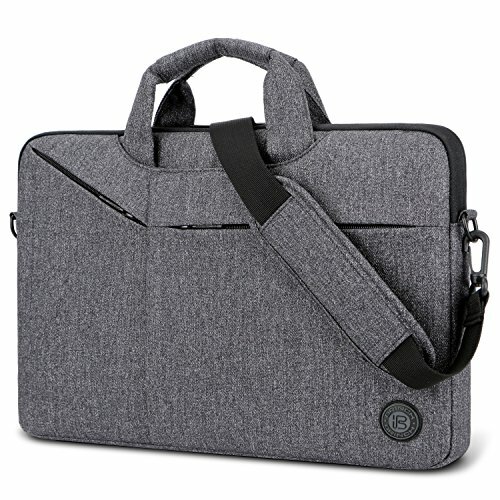 Slim and lightweight; does not bulk your laptop up and can easily slide into your briefcase, backpack, or other bag. Perfect Combination of Leather & Canvas -- Perfectly made of genuine leather and canvas, soft touch, very durable, water repellent & anti-tear. With solid and sturdy hardware for zippers, rivets, buckles, latches and double sewing to ensure long lasting durability. Roomy for organizing -- (1)2 big pockets under front cover offer quick access for handy daily items. 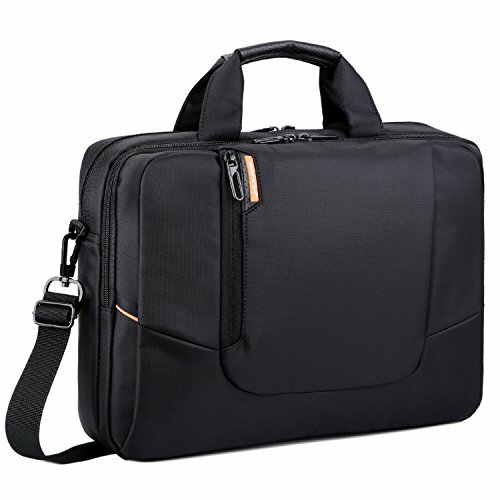 (2)Full padded laptop compartment can fit 15.6 inches laptop and protects your laptop from bumps and scratches. (3)Different inner pockets can accommodate various articles. (4)The rear zipped pocket is convenient to put mobile phone. Protective -- Built-in separate laptop sleeve with soft pads & elastic fixed strap protects your laptop very well. Front Cover with magnet buckle outside & zipper access inside is anti-theft and offers a private space. Carry In Comfort -- With sturdy soft leather padding handle, you can carry this messenger bag as a business briefcase or a handbag. It also features a wide padded shoulder strap that eliminates shoulder fatigue. 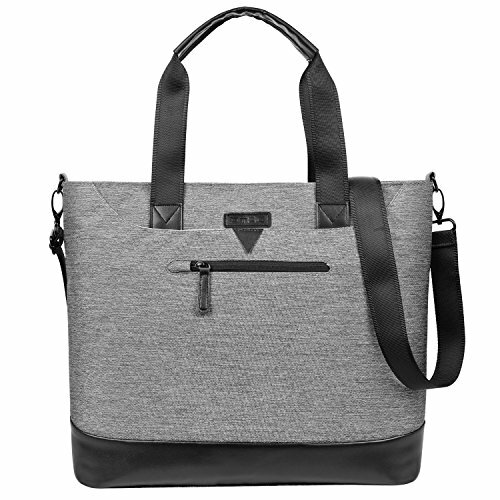 The bag can be carried by the handle, worn on shoulders, and positioned cross body with the adjustable removable shoulder strap comfortably. Dimension -- The external dimension of this briefcase is 15.7"(L) x 12.6"(H) x 4.7"(W); Laptop sleeve is 15"(L) x 10.2"(W), fits most up to 15.6 inch Laptops. It has fashionable appearance to be an ideal travel bag, work bag, school bag, business shoulder bag etc. 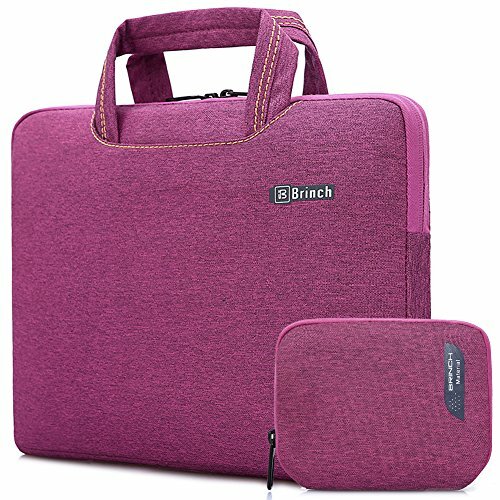 This BRINCH Shoulder Strap is professionally designed to be Universal Replacement, fits all kinds of bags,like Laptop Bags ,Messenger Bags,Briefcases, Duffel Bags,etc. 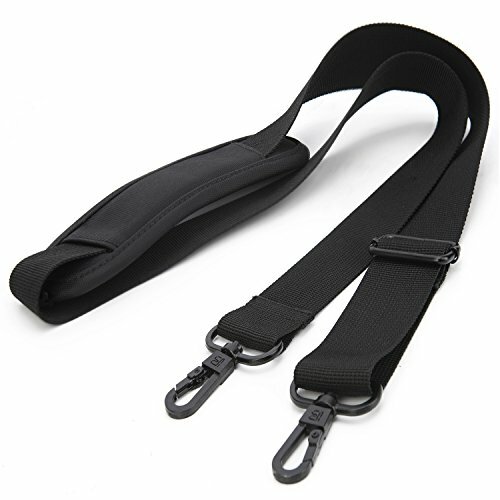 Made of high quality material (Nylon Strap + PU Leather Pad + Metal Hooks),very durable and hold up to 550lb(250KG). Long enough(52.4Inch) and can be easily adjusted to the suitable length according to your need. Thick leather anti-slip pad makes it carry for a long time in more comfort. Metal Hooks is designed to 360 degree rotation and very sturdy. Strap Sizes: 133x3.7CM / 52.4x1.5 Inch; Pad Sizes: 20x7CM / 7.9x2.8 Inch; Weight:0.1KG/2.2lb. 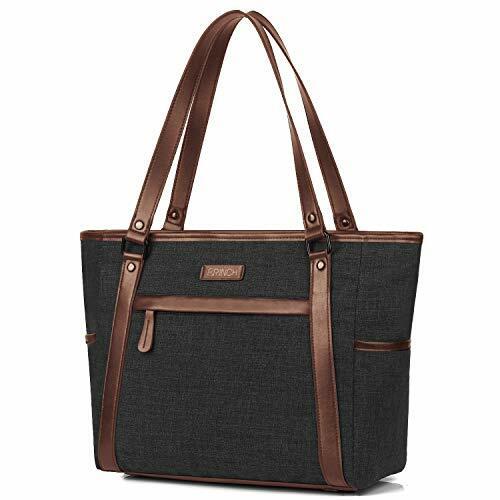 This laptop tote bag (Enlarged Version) is stylish,attractive,lightweight,Multi-functional and practical for work,travel,shopping or school. It has enough capacity to organize daily-used items such as books,office papers etc. easily and reasonably. Zipper pull enable easy and quick access to the laptop or accessories inside. 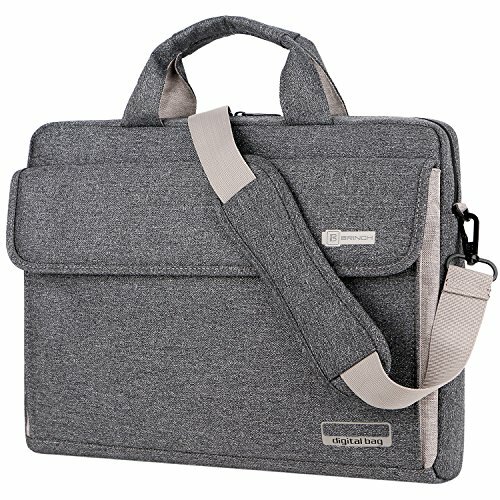 The laptop & tablet PC compartments with thick soft foam padding & elastic velcro fixed strap provide extra protection,that effectively absorbs accidental bumps, reduces damages caused by impacts, and protects your devices from scratches.Various pockets are reasonably designed for phone,wallet,cards,pens etc.. Roomy for books,wallet mouse,adapter at middle. Back compartment is ideally designed to be convertible with velcro closure on top and zippered closure at bottom,that is not only a big pocket for big item such as books, but also could be firmly fixed to trolley suitcase when open both on top and bottom. With a removeable adjustable shoulder strap, this tote bag can used as a crossbody bag as well; Dual sturdy long leather handles for long-time comfortably carrying by hand or shoulder. Bag Size: 45CM x 35CM x 9CM(17.7x13.8x3.5inch),Laptop Compartment Size:40CM x 30CM(15.7x11.8inch),fits most up to 15.6 inch Laptop / Notebooks / MacBook / Ultrabook /Chromebook ( Apple Macbook / Acer / Asus / Dell / Fujitsu / Lenovo / HP / Samsung / Sony / Toshiba etc. ).may not snugly fit all computers due to variations in the sizes of different models. 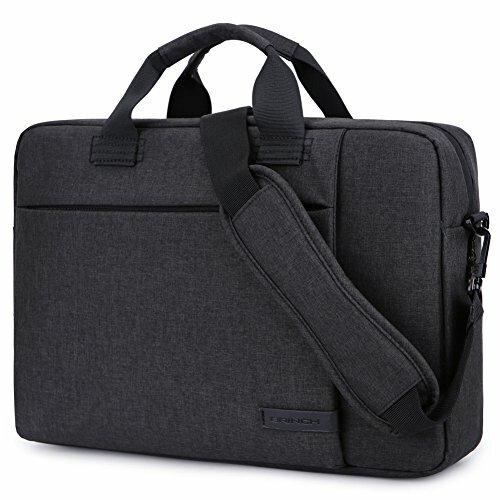 Slim & Light -- This laptop bag is well-designed to be Not Bulky, only 4cm thick, but has various pockets and compartments to hold daily essentials like laptop ,iPad, pen, phone etc. 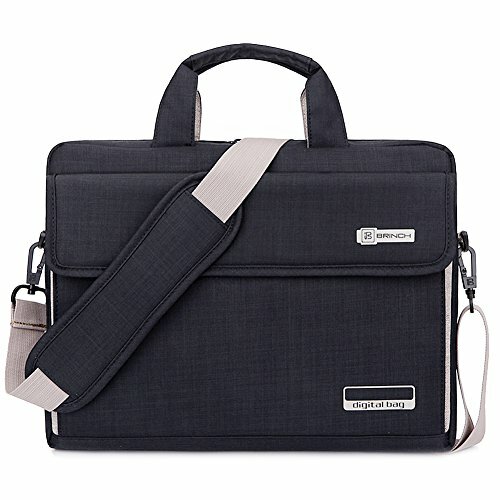 Slim Light design makes it not only a perfect carrying briefcase / messenger bag, but also an ideal laptop sleeve that can be put in your luggage. Very good choice for Travel and Everyday use. 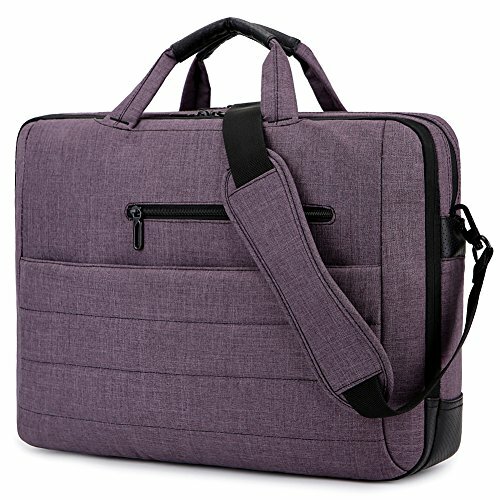 Well Protective -- Laptop Compartment padded with soft thick padding and fluffy lining,protects your laptop very well from accidental bump,shock,scratch. 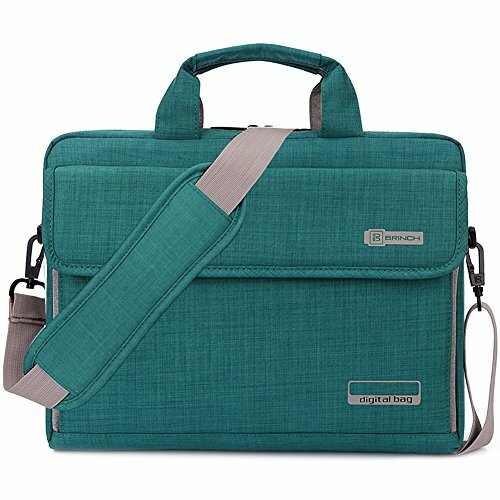 Water Resistant & Durable -- made of high quality anti-tear water-resistant nylon,keeping inside items dry against from splashing water, even on rainy day.Excellent Sewing makes this laptop bag more durable,lasting much longer. Very Portable -- You can carry this bag in your styles conveniently,carry it On hand by handles,On shoulder / crossbody by shoulder strap,over trolley suitcase with luggage strap,or hide the handles to be a laptop sleeve case. Sizes -- Exterior:39.5x28x4CM/15.6x11x1.6Inch, Laptop compartment:37.5x26CM/14.8x10.2Inch, fits most 13 - 14 inch Laptop / Notebooks / MacBook / Ultrabook /Chromebook (Apple Macbook / Acer / Asus / Dell / Fujitsu / Lenovo / HP / Samsung / Sony / Toshiba etc). may not snugly fit all computers due to variations in the sizes of different models. With detachable and adjustable shoulder straps,comforable handles for carrying, also can be easily over handles of suitcase with the luggage strap for your travel. Sizes -- Exterior:42x29x4CM/16.5x11.4x1.6Inch, Laptop compartment:39x27CM/15.4x10.6Inch, fits most 15 - 15.6 inch Laptop / Notebooks / MacBook / Ultrabook /Chromebook ( Apple Macbook / Acer / Asus / Dell / Fujitsu / Lenovo / HP / Samsung / Sony / Toshiba etc. ).may not snugly fit all computers due to variations in the sizes of different models. Bag Exterior Size:400*290*40mm , Interior Size:390*280*35mm, fits 15.6" Laptops / notebooks. 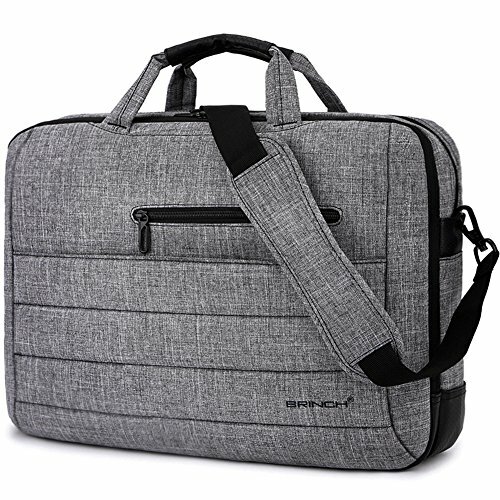 Made of quality anti-tear lightweight fabric,features a thick foam padded laptop sleeve with velcro strap in main compartment, that protects your laptop from accidental bump,shock,scratch. 2 non-zippered pockets can hold mouse,adapter, and middle is very roomy for big items, such as books. Zippered front compartment with 2 small pockets and 2 pen pockets inside is ideal for your phone,pens etc. A back belt is designed on the back, that is easily fixed to trolley suitcase firmly on travel. Sizes: Exterior-43x31x8CM/16.9x12.2x3.1Inch,Laptop Sleeve-40.5x28CM/15.9x11Inch, fits most 15 - 15.6 inch Laptop / Notebooks / MacBook / Ultrabook /Chromebook ( Apple Macbook / Acer / Asus / Dell / Fujitsu / Lenovo / HP / Samsung / Sony / Toshiba etc. ).may not snugly fit all computers due to variations in the sizes of different models. Fit most 15.6 inch laptop ultrabooks. Macbook Pro retina, Asus X551MA-SX018H, Toshiba Satellite C55-A-1UC, Lenovo G500, Acer Aspire E1-530, Acer Aspire E1-572,Dell Inspiron 15.6-inch Laptop, Asus X551CA and etc. 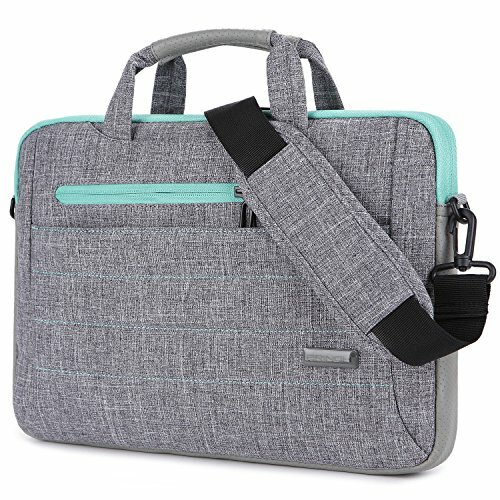 Made of top quality comfortable fabric,features a thick foam padding laptop compartment with hook&loop closure protecting your laptop from accidental bump,shock,scratch. 2 non-zippered pockets can hold mouse,adapter.